Amazing selection of daily, weekly and seasonal deposit bonuses. Best-looking table games anywhere and decent video poker software too. Relatively small choice of slots games. The objective of our Grand Eagle Casino review is to demonstrate why we believe this is one of the best online options for players who enjoy regular deposit bonuses, unique games and visually-pleasing casino experiences. We also aim to highlight some of the downsides of playing at this online casino so that players who act on our recommendations visit the casino with reasonable expectations. However, not everybody is welcomed by the site. Due to regulatory compliance, you will be unable to create an account if you live in a regulated European jurisdiction, Australia, Japan, Mexico, Brazil or South Africa. If this restriction applies to you, we suggest you stop reading our Grand Eagle Casino review and take a look at these other online casino reviews. Grand Eagle Casino uses the latest HTML5 technology to provide an engrossing online experience via its browser-based platform. No software download or app installation is required. Players can visit the casino from any Internet-connected device to create an account, make a deposit, and enjoy the same range of games – regardless of whether they are playing on a PC or a smartphone. Grand Eagle is one of small group of online casinos operated by the Genesys Technology Group. It has been open for business since 2009, during which time the casino has developed a reputation for high quality entertainment and fair play. The casino software is provided by Saucify and is regularly audited by iTech Labs. The results of the audit are published on the casino web site for everyone to see. Players visiting a Genesys casino for the first time need to be aware of a fairly unique condition regarding deposits. Accounts can be created in USD, CAD, EUR, SEK, DKK and NOK, and the unique condition stipulates you must create your account in the currency of your home country if it is supported. The failure to do so could cause problems when you want to withdraw your winnings. Lucky Creek Casino and Treasure Mile Casino are some of the other online casinos by the Genesys Technology Group. They are very similar, but offer different welcome bonuses, so you might want to check them out too. 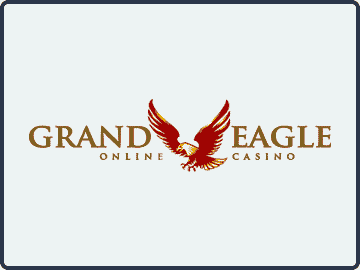 The standard welcome bonus for new players at Grand Eagle is a relatively modest 100% match on first deposits up to $300 (or currency equivalent). Although not an eye-catching offer, the modest amount is deliberate to prevent bonus abusers signing up; and, as you will see later in our Grand Eagle Casino review, the site more than compensates for its modest Welcome Bonus with its ongoing deposit bonuses. This Welcome Bonus has a play-through requirement of 40x the bonus amount before a withdrawal can be requested. This is a better deal than some online casinos that require you to play-through the deposit and bonus amount; but, while clearing your first three deposit bonuses, you can only play slots, keno and scratch card games and maximum bets per line apply. Luckily we can offer you a special welcome bonus of 280% match on first deposits up to an amount of $280, plus another 40 free spins on the Sirens’ Serenade Slot. 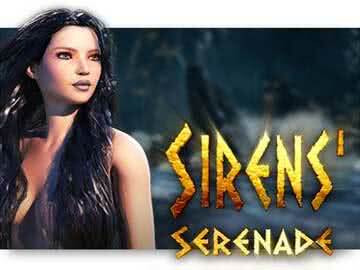 In order to get these special bonuses use bonus code 280SS for the 280% bonus and use bonus code 40SIRENS to get the 40 free spins. Once you have cleared the Welcome Bonus, there is an amazing selection of deposit bonuses to take advantage of. At the time of compiling our Grand Eagle Casino review, there was more than $4,000 available in daily deposit bonuses each week, plus a further $5,000 and hundreds of free spins available throughout the month. These are in addition to the regular bonuses available through the VIP Club. What really made us sit up and take notice of the deposit bonuses is the wagering contributions for non-slots games. These are really generous compared to most other online casinos – for example, your action at the roulette tables contributes 50% towards clearing deposit bonuses (after your first three bonuses) as does playing Three Card Poker, while playing Baccarat contributes 25% to the wagering requirements. Although not having such a wide choice of slots games as other online casinos, the selection is of the highest quality. It has often been said of Saucify that unique concepts are developed for each game produced, rather than rehashing old ideas, and this is one of the factors that makes us keen to recommend the casino in the conclusion to our Grand Eagle Casino review. The quality of the slots games is mirrored by the quality of the table games – possibly some of the best we have ever seen. Each game flows seamlessly and you have the option of trying each game in practice mode before investing any of your own money. The portfolio of games is completed by a good selection of video poker games with the choice of single-line games up to fifty-line games. With regard to withdrawals, these are processed daily provided you have validated your account and completed a withdrawal request form, but can take up to 72 hours for the transaction to complete. Withdrawals to eWallets and Bitcoin are free, while payments to credit and debit cards cost $7.00 in the states and $15.00 elsewhere. If you prefer to receive a check, you can request one to be sent to you via regular mail (costs $/€/£15.71) or couriered to you via Fedex (costs $/€/£30.00). Provided you can get your head around the convoluted withdrawal process and some of the other quirky terms and conditions, there is plenty to like about Grand Eagle Casino. Sure, there are better Welcome bonuses available, but few online casinos give you as many reload deposit bonuses as Grand Eagle Casino or make it worth your while trying to clear them playing roulette. Non-stop deposit bonuses with good wagering contributions for table games. High quality Saucify software provides unique games and seamless gameplay. Well-established online casino with a reputation for timely cashouts and fair play. First three bonuses are slots-exclusive. No Live Dealer games or Craps tables. Cashout limits on winnings from free spins. We said at the beginning of our Grand Eagle Casino review we believe this is one of the best online options for players who enjoy regular deposit bonuses, unique games and visually-pleasing casino experiences. We hope we have also made it apparent that, not only are the deposit bonuses regular, but they are easier to clear than most other online casinos because the play-through requirements apply to the bonus only, and non-slots games have a good wagering contribution. Because of a few quirky terms and conditions, we recommend you read them through when registering your account rather than just agreeing to them. Although most players will be unaffected by them, there may be one or two that apply in your specific circumstances. Other than that, provided you do not live in a restricted territory, we are confident you will enjoy a visually-pleasing (and hopefully lucrative) casino experience when you visit Grand Eagle Casino. Visit Grand Eagle Casino Now!